Use our secure cart for ordering online. Online pricing is available with login. If pricing does not appear, please submit the shopping cart and pricing will be sent to you by email. Select purchase order for your payment option. Order will be completed after confirmation of pricing. To place an order by phone or fax, simply have your billing and shipping address available, as well as your purchase order number. You may also pay by American Express, Visa or MasterCard. You will only need to supply us with your credit card number and its corresponding expiration date. Once your order is placed we will ship it to you within 24 hours. That is all that is necessary. 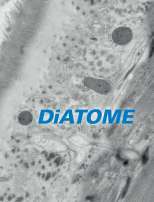 Diatome is an American based company with subsidiaries and branches in most countries of the world. For our branch and or distributor in your country please Email us directly and we will reply immediately. If you would like to have our literature sent to you by mail, please fill out and submit the contact form and we will reply immediately. You may also directly download the product brochures. Click here to go to the product brochure page. All new knives as well as exchange knives are in stock for immediate delivery. For our resharpening service our turn around time is no longer than 4 weeks from date that the knife is received by us. In most instances the service usually only takes 2-3 weeks. All of our knives, new or resharpened, are shipped by UPS Blue (2 day air service) at our expense. When you send knives back to us we recommend that you use either UPS or Federal Express and insure the knife for its original value.